In contrast to our dream of a peaceful world without war, the reality we face causes us continuous suffering with more war bases and weapons being built and sold, and more and more soldiers being trained. 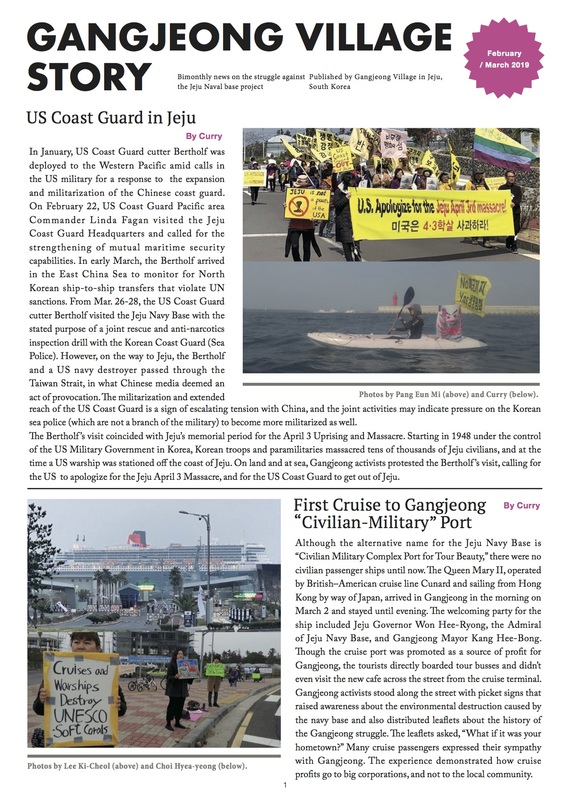 In order to save Jeju, the island of peace, villagers and peace activists in Gangjeong, Jeju Island have been resisting the construction of the naval base and militarism for 8 years. Islands in East Asia are facing increasing challenges of militarism and political tensions. Not very far from Jeju, Okinawa has suffered under the presence of the US army bases for 70 years. People in Okinawa have long suffered due to the United States’ military base camp. Additionally, Economic and military expansion of China are certainly challenging to Taiwan’s peaceful future and the conflict between Japan and China have with the territorial sovereignty over Senkaku/Diaoyu Dao and also Korea and Japan’s Dokdo/Takeshima problems. Furthermore, Korea and China have different views on the Ieo-do (or Socotra Rock) under the surface of the water which is located in the southern ocean area from Jeju Island. All these conflicts and tensions should act as a call for action for peace in the region. The United States government has promoted the Pivot to Asia project and strengthened the Missile Defense System with its military alliance in East Asia. We would like to protect the seas of East Asia surrounding the islands. However, it is impossible to achieve our goal with only a few participants from one or two islands. Rather the people of the whole islands of East Asia should stand with one another in solidarity and cooperation. For this purpose, we plan to host the international Peace Camp, Sea for Peace in Gangjeong, Jeju Island of South Korea from the 3rd till the 6th of August 2014. Please come join us and share the difficulties and harmful effects caused by the militarization that your islands have gone through. In addition, please inspire us for sustaining our hope for Islands of Peace. The program will include an exchange of knowledge and resources related to the reality of the destruction of oceanic ecologies and the US military expansion. Also, we will offer a variety of outdoor activities including kayaking and scuba diving. We will also set a time for participants to get to know one another by introducing their own cultures in a culture night and a peace concert. We would like to invite you all to the Sea of Peace. Through this Peace Camp, we wish to create a wind of hope for peace that can blow into the seas and islands across East Asia, which are shadowed with clouds of soaring military tensions. Our ocean’s ecosystem has been destroyed by many different causes. In this session, we will examine several cases of environmental destructions caused by wars, military training and expansion of war bases. There will be presentations to report first the current situation of Jeju Gangjeong Sea where the naval base is being built, then to report the long struggle against the US bases on Okinawa Sea and finally the destruction of Taiwanese islanders’ marine culture and ecosystem. Three Islands have similar experiences in being victimized by the state power in their history. At the same time, there were also peace activists who courageously resisted the unjust state power. In this session, we will share stories of peace movements that have taken place in the three islands against militarism in order to create a shared understanding for continuous cooperation and solidarity. In this session, we will identify the newly reoriented map of the military strategy for East Asia which has been affected by the changes of the US military policies such as the promotion of the pivot to Asia. In addition, we will discuss the threats to national securities of the countries in East Asia by the US militarism. Participants will discuss long term plans for our next gatherings in order to develop and sustain the solidarity with the islands of East Asia. It will entail further discussions to think of practical ways to promote the movement for solidarity of the demilitarized islands.